Visit many good tones, but live in the ambience of the Spurgeon Hall Reverb. 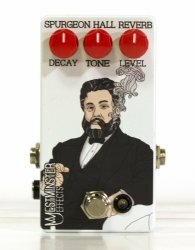 With slight modulation when cranked, the Spurgeon lives for swells and high decay settings, complete with the same, black, red and white theme as Spurgeon's Wordless Book. Also features soft touch relay bypass.